0 Comments Published by KL Ocs Kid on Monday, August 13, 2007 at 9:10 AM. Dirk Kuyt believes Fernando Torres will soon be setting the Premier League alight after an impressive debut against Aston Villa. 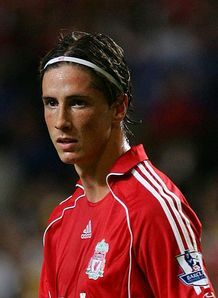 Torres, who joined the Reds in a club record deal this summer, showed signs of forming a dangerous partnership with Kuyt in Liverpool's 2-1 win over Aston Villa on Saturday. The Spain striker was involved in creating Liverpool's first goal, an own goal from Villa defender Martin Laursen, and Kuyt is looking forward to teaming up with the 23-year-old in the future. "I thought that Fernando played well. We had some good chances and we looked good together," said Kuyt. "The first goal was an own goal but the team work between the two of us leading up to it was really good. "Now we will just try to work on things and keep going in the right direction. "It's his first time in the Premier League but I don't think he will need too long a time to adjust. Every player needs a few games when they come in but he has shown already some quality. "With a bit of luck he could have scored his first goal for Liverpool. He is real quality."